Liftoff of Europe's ATV cargo ship Jules Verne on March, 8, 2008. PARIS --Europe's first space station cargo carrier has regained the use of its defectivepropulsion system and has begun orbit-raising maneuvers, European Space Agency(ESA) officials said on Tuesday. JulesVerne, a 41,887-pound (19,000-kg) AutomatedTransfer Vehicle (ATV), was slated to use its onboard engines to raise itsorbit by about 53 miles (85 km), to 214-miles(345-km), in preparation for a series of test maneuvers that should endwith a docking with the International Space Station April 3, mission managerssaid. ?Jules Verne ATV successfully performed a series of orbital maneuversearlier this afternoon,? ESA officials said in a mission status update. ?Twoadditional orbit maneuvers tomorrow afternoon will complete the phasing boost.? ESA launchedthe unmanned cargo ship the on March 8 (Eastern Time) atop an Ariane 5rocket. The first of its kind, the ATV is designed to deliverfood, water, supplies and fuel to the station. One of fourthruster packages on the ATV, each controlling seven motors, wasshut down Sunday shortly after launch when its fuel and oxidizer linesshowed differing pressure levels. While the vehicle is designed to operate withonly three thruster systems working, officials did not want to proceed with theorbit-raising sequence until they had resolved the thruster issue. Programmanagers had said it was unclear whether the pressure difference was real, orreflected a faulty reading by the Propulsion Drive Electronics (PDE) controlsystem, which automatically switched to a backup propulsion assembly. Officialssaid then they would restart the PDE system as part of a series of commands todetermine the cause of the problem. 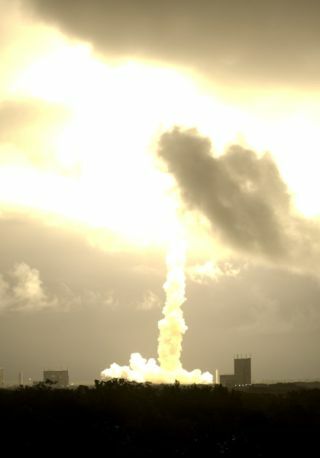 John Ellwood, ATV mission manager at ESA,had said the problem might be a temporary reaction to the vibrations the systemsuffered during launch. ESAspokesman Franco Bonacina said thruster system?s recovery allowed today?s two orbit-raisingmaneuvers. A planneddemonstration of the ATV's collision-avoidance maneuver will be postponed by 24hours, to March 13, as a result of the thruster issue, Bonacina said. Themaneuver is intended to give confidence to space station managers that ATV candock safely with the orbital facility. Jules Vernewill remain in a parking orbit about 1,200 miles (2,000 km) away from the ISSdue to another station-bound spacecraft - NASA?s shuttle Endeavour - which launchedtoward the orbiting lab early Tuesday on a record 16-day-long construction mission.The shuttle?s seven-astronaut crew will deliver a new crewmember, the firstpiece of Japan?s massive Kibo lab and a two-armed Canadian maintenance robot tothe station during their spaceflight. AfterEndeavour departs the space station on March 24, Jules Verne will prepare fortwo planned demonstration days, initially scheduled for March 29 and March 31,respectively, before docking on April 3. SPACE.comSenior Editor Tariq Malik contributed to this report from New York City.